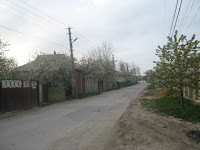 A week ago I arrived back in Moldova. It’s been a busy week. I went straight from the airport to my new apartment but it’s only today that I have been able to put any time into making it feel like home. Every day this week I was teaching a two-hour class on the Biblical Basis of Missions to our group of @ 20 students. I really enjoyed the teaching and was glad to be able to do it in English. That’s because Victor is home for this month and he translated for me – and did a great job. We both felt that we made a good team. Translating is a very challenging responsibility and there are only a few people who are so good at it that you are hardly even aware that it’s happening. Victor is one of those wonderful people. My hero of the week is my team-mate Eugen. One of the blessings of being on a team here in Moldova is that the young men on my team are always so willing to help. And one of the amazing things about Moldovan culture is that you never hear “just a minute”, or “I’ll try to get to it next week”. An immediate need generally gets an immediate response, if at all possible. *I needed a new SIM card for my mobile phone. Eugen took care of it for me. Then he wrote down all the phone numbers of people that I needed. *I wanted to use my car. Eugen, Mihai, Andrei and Silas (with Ivanir overseeing!) all helped to move it – in fact, they actually LIFTED it at one point, with me in it!!! Then they changed the flat tire, and then they pushed it up and down the road trying to get it started. We ended up having to leave it until Slavic came back – then he took care of it and by Friday I was finally , and happily, driving again. After a week of trolleys and rutieras, I was relieved to have my car again. *My computer cord seemed to not be working. I walked into the office where Eugen was working and asked if he could fix it. Within minutes, Eugen and two others had determined that it wasn’t the cord but the outlet adapter and they had repaired it! 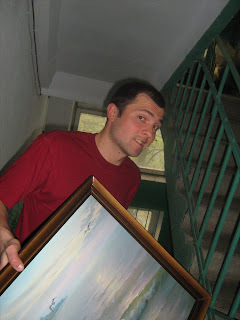 *On Friday when the team van was finally available I asked for help moving the few pieces of furniture that I wanted to bring to my new apartment. Eugen, Lilian, and Sergiu rose to the occasion and helped carry furniture and boxes up four levels (no elevator in my new building!) with willing hearts and smiles on their faces. How blessed can one woman be? Posted by Barb at 1:26 a.m.
Dear Barb, You don't know me but I have enjoyed your blog for the past 5 months or so. It is so exciting! I too am a missionary, currently in the States, but returning to Ukraine in June. I'm praying for you. Keep up the good work!